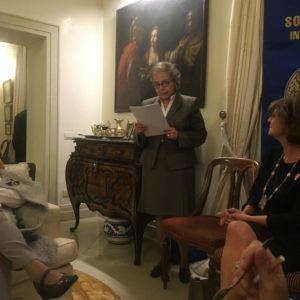 On 16 May 2018, a side event took place organized by the Government of Israel, Soroptimist International, the Committee on the Status of Women Vienna, and the Women’s International Zionist Organization, at the CCPCJ. The prominent theme of the twenty-seventh session, was “Criminal justice responses to prevent and counter cybercrime in all its forms, including through the strengthening of cooperation at the national and international levels”. Zvi Wiener of the Hebrew University of Jerusalem presented on ‘Fintech for better and worse’ and how technology and research are changing the world of financial services, through the introduction of new currencies, the use of artificial intelligence, and by creating advanced financial models and new services amongst other things. Discussing how such changes affect lives, he discussed how additionally, some of these technologies serve as a convenient and unregulated platform for illegal activities including money laundering, terrorist funding and serving markets for illegal goods and services. It is both impossible and unwise to stop the development and use of technology. The best strategy would be for countries all over the world to cooperate on an international level and to create and regulate the appropriate frameworks that will allow the technology to be used while managing the risk and the potential damage of criminal activity. Rather than ban new technology, cooperation between governments, regulators and academia can lead to better and faster solutions for all, based on research in the area of Fintech. Sophie Schock, University of Vienna, spoke of the impact of Cryptocurrencies and Blockchain-Technology on Women. Whilst most people have heard of Cryptocurrencies such as Bitcoin and Ethereum, other cases of the underlying Blockchain-Technology are – unjustly – less popular. 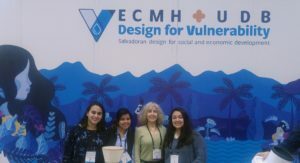 Due to its special property to store immutable data, Blockchain-Technology can be used, inter alia, to empower women and girls around the globe in humanitarian crisis situations. UN Women has recognized this potential and launched Blockchain-projects dealing with identity verification. By scanning biometric indicators, authorities can identify women or girls who have been trafficked or reported missing. Blockchains are predestined to serve as a reliable source where governments or other institutions are unable or unwilling. The downside lies in the type of data that is used: biometric indicators, like finger prints or retina scans, are by nature highly sensitive. This raises many legal questions, which are inherent to decentralized databases, for example: Which legal system is applicable and who is responsible in matters of data protection? Summarizing, using biometric indicators and the Blockchain-Technology for proving identity is – without a doubt – very efficient; but concerning legal aspects it’s also highly questionable. Martin Kreutner, International Anti-Corruption Academy, discussed and questioned new technologies in a presentation entitled – Towards Criminal Justice 4.0. Digitalization, big data, block chain and bitcoins, invasive analytics. Martin askedand discussed whether the fourth industrial revolution should be considered a chance, challenge, or threat? Does it have the potential to contribute to and foster social, economic, and political development or is further widening the gap and divide between various parts in society, adding additional hurdles for vulnerable groups while further privileging the elites? Is it just a new, untraceable modus operandi for the ‘bad guys’ or rather a set of capable, innovative tools for successfully fighting serious crime phenomena, such as human trafficking, corruption, the proliferation of WMD, organized crime, etc.? Soroptimist International representatives to the United Nations Environmental Program (UNEP) in Nairobi worked together with Women for Water Partnership (WfWP) members to organise an event at Ngara Girls High School Nairobi, Kenya. They mobilised school girls, women and others to participate in school environment clean-up and tree planting to mark this year’s World Environment Day, June 6 2018. 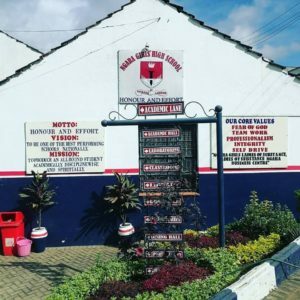 Ngara Girls High School is situated right in the middle of the Jua-Kali (open air) industrial part of Nairobi’s central business area. Motor garages, small-scale business artisan trading sheds and an open-air market are close to the school and attract a great deal of plastic waste. World Environment Day and its slogan ‘If you can’t re-use it, then refuse it’ provided the opportunity to educate over 1200 Ngara girl students and neighboring communities, to the need for clean surroundings, and to the dangers brought to the environment by plastics waste. For this event, SI and WfWP UN Representatives Asha Abdulrahman, Sophia Kipkoech and Mary Muia partnered with School Board of Management, UNEP, UNESCO, Center for Environment Justice and Development, SI Union of Kenya (SIUK) members led by President-Elect Juliet Wamiri, Kenya National Roll Ball Team and the Kenya National Football Team. The speakers at the event urged students and communities around the school to break up with single-use of plastics, advocating for a life without single-use plastic items, to save the planet from plastic pollution. SI UNEP representative Mary Muia, who is also Chair of the Soroptimist International Future African Federation taskforce, encouraged students to choose pathways to careers and not conform to stereotypical ideals and roles on what girls can or cannot do compared to boys. “Girls have what it takes to be water engineers, environment experts or to have other science and technology related careers” said Mary in her motivational speech to the girls. Liliana Mosca, SI representative to both the United Nations World Food Program (WFP) and the Food and Agricultural Organisation (FAO) in Rome, whose work focuses on women’s role in food production, women in rural areas, and food security, gave a speech with the title ‘The Future of Water and Women: the Blue Gold in Africa’ at the home of the Vice President of SI Club Napoli, Carolina Visone. Also present was Patrizia Salmoiraghi, the President of Italian Union. The blue gold, of course, being water. She talked in-depth about the importance of water globally and in Africa specifically, about Water Wars of which hundreds have taken place and more are expected, about water and human rights, water and the SDGs, the effects of water issues on women, and the actions being taken to avert further disaster. Liliana said: “We must be aware that the future of humanity will mainly depend on how we will use water and above all, how women will use it, whose life is deeply affected by it.” Read a full report of her speech here. by Sandy Hecker, SI UN Representative, New York, 2018. Theme: ‘Transformation towards sustainable and resilient societies’. The United Nations Forum on Forests opened its thirteenth session attempting to persuade Member States to implement the United Nations strategic plan for forests (2017-2030), thus contributing to the achievement of the 2030 Agenda for Sustainable Development. 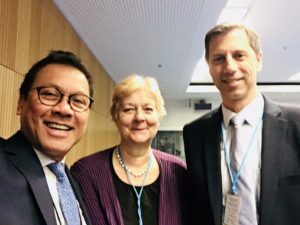 The Earth Negotiations Bulletin (ENB), provided a daily comprehensive review, and the Outcome Document UNFF30 Omnibus Resolution, which will be presented at HLPF in June, provides a comprehensive review of the 5-day session. 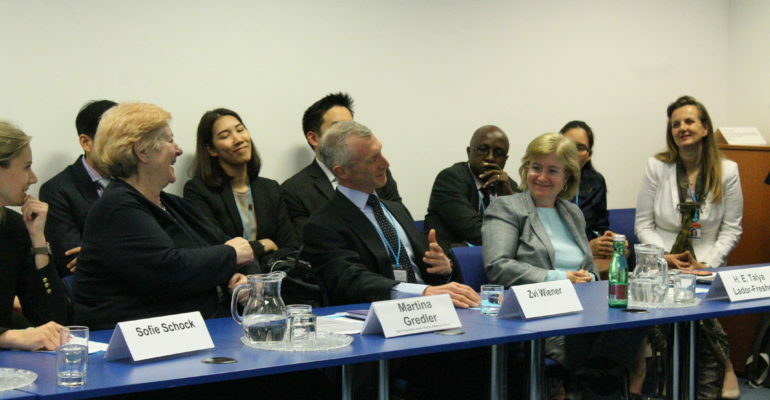 Sandy attended several side events, however here she focuses on one. “The Korean Forest Ecosystem Restoration and Biodiversity was organised by the Secretariat of the Convention on Biological Diversity, with financial support from the Korea Forest Service of the Government of the Republic of Korea. A nation impacted by forest degradation and deforestation, and moving towards reforestation and restoration of their ecosystem, the Republic of Korea enlisted the aid of Forest Ecosystem Restoration Initiative (FERI), Society for Ecological Restoration (SER), People and Reforestation in the Tropics; a Network for Education, Research and Synthesis (PARTNERS), and Food and Agriculture Organization of the UN (FAO), and with the increase in national budget, believes it can achieve the SDG goals by 2030. Women related issues only came up during the question and answer section when the women in the conference room expressed disappointment at how little attention was being given to gender issues in relation to deforestation and forest degradation. In the 5-day forum, Member States only briefly addressed how these issues impacted women more than the men. In one session a Member State addressed social and economic inequality, and how it affected women’s mental and physical health as well as a their independence. In the Trusteeship Room, women present agreed that more needs to be done to bring gender inequality in relation to forest degradation and deforestation onto the agenda of the HLPF. Forest Ecosystem Restoration Initiative (FERI) supported by the Korea Forest Service, gave an excellent presentation. Its objective is to support concerned parties in developing countries as they develop plans and work towards national targets for ecosystem conservation and restoration. Crucial to successful implementation is knowledge of products, direct support, capacity building, outreach and partnerships, and analysis of national commitments. FERI is currently directly supporting eight country projects with four more countries in the pipeline for funding in 2018. The success of HLPF resolutions can only be achieved by addressing the water crisis and giving more financial support”. by Marie D’Amato-Rizzi, SI UN Representative, New York, 2018. “Prince Zeid bin Ra’ad, the outgoing UN High Commissioner for Human Rights gave a very informal and frank talk at a morning meeting in New York. He spoke about how Geneva and New York are very different. The UN in New York is not hospitable. It is focused on Africa and the Security Council wouldn’t even discuss human rights in Syria, which he said was absurd. He also mentioned that the Regional restructuring of the 5th Committee is not good. He attended the Spring Conference of the World Bank and the IMF even though Egypt didn’t want him there. He said the mere fact of his being there was encouraging. He also noted positive things happening in Ethiopia under the current Prime Minister and stressed the need for a better language to explain what Human Rights is to the general public. There is too much legalese which is meaningless to the public and he shared his motto “In truth there is power” also stressing that the HR movement defends ALL rights, and that groups should support one another. The UN reflects country dynamics however the HR Commission is not intimidated by member states. As important as this issue is, HR Commission is only 3% of the UN budget. Having been in his position since 2014, he is not seeking a second term, suggesting that he knows there is no way he would be confirmed as he has been so outspoken! 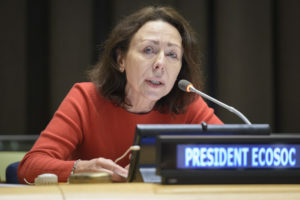 Prince Zeid bin Ra’ad believes the position should be limited to one term of about five or six years and he encouraged the audience to read the Commissions Reports and Updates. His successor will take office in September after approval by the General Assembly. Note: The Secretariat of the United Nations solicits nominations for the position from the Permanent Missions to the United Nations. Follow-up SI: SI clubs/Unions could petition their government, if they have a good Human Rights track record, to nominate an individual for this position”.